Google's "X" lab, a highly-secretive research center that specializes in robotics and speculative technology, is investigating a list of 100 "shoot-for-the-stars ideas," according to a new report from The New York Times. The lab is reportedly based in a secret location, with many of Google's own employees unaware of its existence. To uncover information about the group, the Times interviewed a dozen people about the project, none of whom were willing to be named. One Google engineer familiar with the project said it was "run as mysteriously the C.I.A.," with an unassuming office for logistics located on the tech giant's Mountain View, Calif., campus, and a second undisclosed location for robots. The lab is also said to be modeled after the Xerox PARC labs that inspired Apple co-founder Steve Jobs and other Silicon Valley pioneers in the 1970s. 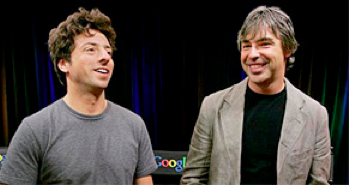 Google co-founders Larry Page and Sergey Brin reportedly worked together to come up with the list of ideas. Brin is said to be "deeply involved" in the lab, as was Page before he took over for Eric Schmidt as CEO in April. Both founders reportedly have had a "longtime fantasy" of space elevators that would collect data or transport objects into space. "Google is collecting the worlds data, so now it could be collecting the solar systems data, said Rodney Brooks, a professor emeritus at M.I.T. Rather than the software-centric engineers Google has gathered together for other teams at the company, Google X is populated with roboticists and electrical engineers, the report noted, adding that researchers have been hired from Microsoft, Nokia Labs, Stanford, M.I.T., Carnegie Mellon and New York University. Robotics and artificial intelligence expert Sebastian Thrun is said to be a leader at the lab. Thrun invented the first driverless car, a concept that has long intrigued Google's founders and is believed to be a key area of research for the lab. According to one tipster, Google is considering it as a new business opportunity and may go so far as to manufacture driverless cars in the U.S.
Also at Google X are Andrew Ng and Johnny Chung Lee. Ng, a Stanford professor, uses neuroscience to fuel artificial intelligence research in hopes of making robots more like humans. Lee, who worked on Microsoft's Kinect device before joining Google, apparently serves as a "rapid evaluator" for the lab. Though much of the X lab's work is years away from being released, two of the report's sources said that one of its products will be released by the end of the year. More mundane projects for the team include work on what Google calls the "Web of things," a method of connecting everyday objects to the Internet. Items considered for online connectivity include a garden planter, coffee pot and a light bulb, the Times reported. In fact, Google announced at its I/O conference in May that it plans to release an LED light bulb that can be controlled by Android devices. As is to be expected, Google declined to comment officially on the lab, though a spokeswoman did say that interest in speculative projects is an essential part of the company. While the possibilities are incredibly exciting, please do keep in mind that the sums involved are very small by comparison to the investments we make in our core businesses, she said. Page himself has downplayed the size of the impact that Google's futuristic projects has on the company's bottom line. Investors have kept a close watch on Page since he took over, with some complaining that he didn't speak enough during his first earnings call as CEO in April.